it is in a large fishbowl looking thing made completely of glass. Not circlular, but square with rounded corners. I am perplexed that there aren't drain holes. I have no idea the species of cactus...there is a large round one with long prickly things, a small round one that is similar, thereis this spongy looking green thing, then there's these yellow-green leave things and a set of pink ones. Looked at some photos online and I still have no idea. Looks like bottom of glass jar has some sand, then some soil, then more sand (1-2 cm). I don't know how to load a photo to show you. Mom said the cactus would like the dry air in my house (I don't think the air is dry..we have humidifier running on furnace). AND the care instructions she gave from wherever she had this made just said to 'give it a little spritz every blue moon'. I haven't even had it a month and it looks like the pink thing is dying. I gave it a few sprays of water yesterday and then again today because it looked worse. I water my jade plant once a month so I figured the cactus would be about the same. I can't touch soil with finger as jar is deep and I am not adventurous. I would like to attempt to keep alive...please help! 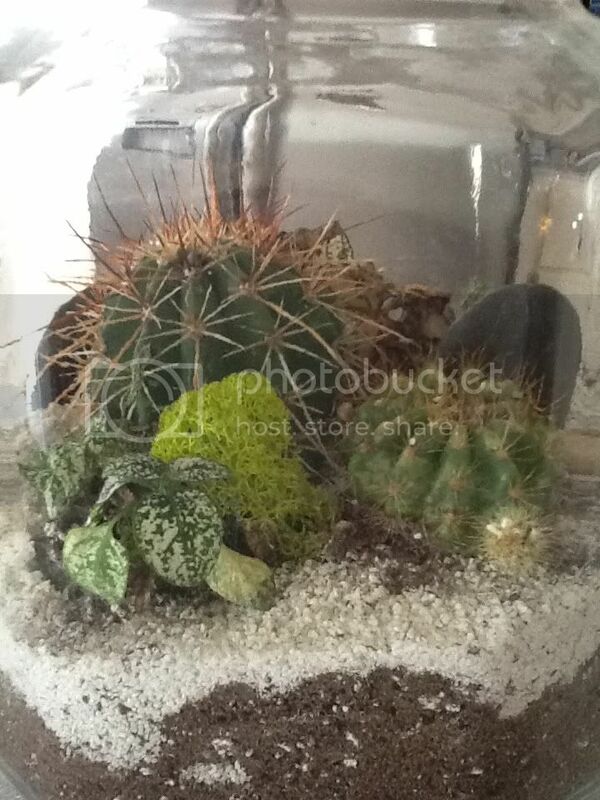 Personally, I am not a proponent of trying to grow cacti in a terrarium. I actually research the soils and weather patterns in the areas where my cacti grow as natives, then do my best to replicate those conditions for them in my home. I have always found it too complicated and too much work to try to force plants to grow under conditions they aren't happy with. It can be done, but I have better ways to spend my time. So, to post a picture here, follow the instructions at this link: Posting Pictures & Photos. Once I see a pic of your terrarium, I might be able to offer you some guidance on its care. Then again, I might just advise you to remove the cacti and plant them in ordinary containers, where they won't be killed by exposure to poor drainage, insufficient light, lack of air circulation, and too high of humidity. Terrariums are nice, but one of the reasons people like them is that it's easy to keep the soil constantly moist and the humidity higher than it is in most homes. There are many plants that just love such conditions. Those are the plants I would put in a terrarium, not plants that require coarse soils that need to be thoroughly drenched then allowed to dry quite a lot. Such plants, which would include all desert cacti, also require very bright light. In addition, they must have good air circulation around them to prevent fungal infections. One exception might be that certain jungle cacti, which commonly live in trees in tropical forests, might be successful in a terrarium. But they would require particular growing media, very careful attention to watering, and in short, a whole lot of work. 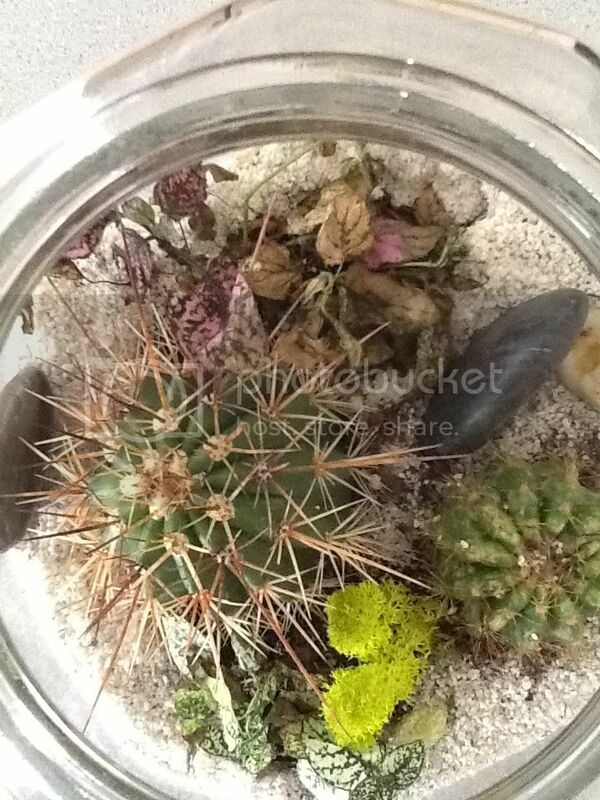 If it turns out that the cacti in your terrarium are jungle cacti, then the set up might work. If they are desert cacti, I don't hold out much hope for them. I couldn't hope to decipher what the manufacturer means by "give it a little spritz every blue moon." Exactly how often does a "blue moon" occur, and precisely what is "a little spritz"? I have no idea. These terrariums such as you have are popular right now. I foresee a lot of dead cacti in the future. Sorry about that. I hesitated to post the other day, because I knew it would take a long explanation that I wasn't quite sure how to word. I'm glad I waited, because Kisal said it ALL...and so much better than I could ever hope to convey!! My best advice would be to remove all the plants & put in their own pots in a very sunny windowsill or out on a balcony (if you have one). Cactus do not want to be houseplants. Good luck! First photo is looking down into terrarium. Second photo is looking from one side. I think this is one with green leafy cacti that is beginning to wilt. Third photo is from opposite side. The purple-ish leafy plant is definitely dying...not thinking there is much help for this one. My suggestion is be very careful when watering. I don't think it has any drainage holes, am I correct? Plus it being a glass terrarium it is gonna hold water more too. @PunkRotten - you're right that there aren't any drain holes. Not sure how much water to give since excess can't drain. No drainage is the primary problem with your terrarium. If you read about the weather patterns in most desert areas, you'll find that there are infrequent, but quite heavy, rainstorms. I have found that my cacti grow best when I drench them or soak the pots, allow all excess water to drain off, then don't water again for 2 weeks or more, depending on the time of year. You can't do that in a terrarium, because there is no way to drain off the excess water from the drenching or soaking. The little Pink Polka Dot plant (Hypoestes phyllostachya), and the other leafy plant in your terrarium are dying from lack of water and humidity. They are the type of plants commonly used in terrariums, because they enjoy evenly moist (but not soggy) soil, and also high humidity. 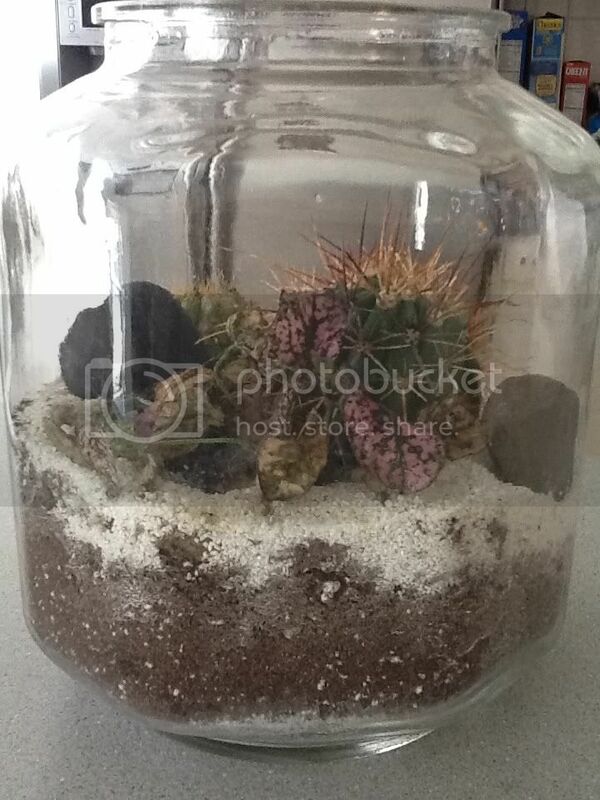 This is an example of why I described these desert terrariums as a "fad". They aren't put together with any thought toward the success of the plants in them. Yours, we see, has plants that require the exact opposite in care, if they are to survive. As a person who enjoys plants of all kinds, it kinda makes me sad to see them thrown together this way, with no thought to their survival. You are left with the choice of watering the terrarium in a way that might keep the cacti alive for awhile, letting the leafy plants die. Or, you can water enough to keep the leafy plants going, and the cacti will die of root rot. The little Pink Polka Dot plant is just a seedling. They get quite a bit larger and make very pretty houseplants. They do not require the terrarium to live. But it is not a desert plant, so does not store water in its tissues. It can't live and grow in the same soil alongside a cactus. got a couple of clay pots so i can re-plant the cacti in one and replacement leafy plants in the other. There isn't much hope for the original leafy ones. And the smaller of the cacti has these little spots on it. Hoping the transplant helps it get better. I'll have to go back to the store tomorrow and get a new bag of cactus soil. I should've checked the bag I had before I went ... molded, yuck! That glass tank would be nice for a carnivorous plant or some other bog plants.